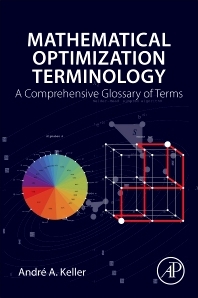 Mathematical Optimization Terminology: A Comprehensive Glossary of Terms is a practical book with the essential formulations, illustrative examples, real-world applications and main references on the topic. This book helps readers gain a more practical understanding of optimization, enabling them to apply it to their algorithms. This book also addresses the need for a practical publication that introduces these concepts and techniques. André A. Keller is an Associate Researcher at the Computer Science Laboratory of Lille University, Science and Technology, France. He received a PhD in Economics (Operations Research) from University of Paris I Panthéon- Sorbonne. He is a reviewer for international journals including AMM, Ecol.Model., JMAA and a Member of the JAST editorial board. He presented several Plenary Lectures at International Conferences and was Invited Professor in different countries. As a Full Professor, he has taught applied mathematics and optimization techniques, econometrics, microeconomics, game theory, and more in various universities in France. His experience centers are in the building, analyzing, and forecasting with large scale macro-economic systems within research groups of the French CNRS. Other domains of experience are notably discrete mathematics, circuit analysis, time-series analysis, spectral analysis, fuzzy logic. He has published numerous articles, book chapters, and books. The books are on topics such as time-delay systems, and multi-objective optimization.